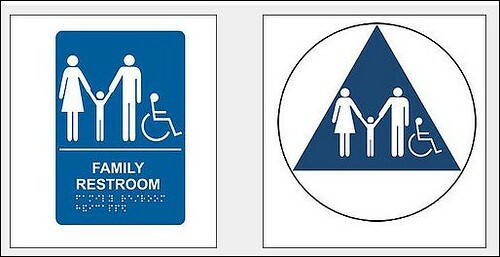 Are you looking for ADA FAMILY RESTROOM Signs? Rules and Regulations for Handicap Parking Signs and Spaces that you need to know. Parking Signs or No Parking Signs - The Clearest Method of Knowledge.The Sign Studio is your go-to place for Handicap Signs, Parking and Traffic Signs, Safety Signs, and more! ADA Restroom Signs – Most Common Types For Your Business. Your sign is your best employee! The first impression is the only impression. We’ve all heard that song before. And you can’t change that first impression even if you tried; it’s what people hear and see and remember. That’s why your signage is so important. A sign can speak volumes about your company, products and services. So what you definitely want is a sign that actually speaks to the customers and says, “Hey…look at me and remember me!” You want a sign that speaks personally to each person who sees it, enticing them to come in, look around, you’re welcome here, because customer loyalty is a great value in business and when your sign is readily recognizable, long term success is almost assured. You want signage that introduces you and shakes the hands of those passing by. Remember that a sign works and speaks for you twenty-four hours a day, three hundred and sixty-five days a year, absolutely making it your best employee ever! Take a ride in your local area. Start noticing signs just where you live, and you'll realize that you can’t look anywhere without seeing one. So why not make yours stand out among the rest? Why not make your company’s first impression the lasting impression? Have you considered how new customers find your business or learn of your product? There are many types of advertising and ways to grow your business; direct mail, social media, print ads, the Internet, and word of mouth are all effective ways to find exposure. Yet none of these outlets are as prevalent, or permanent, as well constructed, thoughtful custom signs. Signs are one of the most effective, efficient, and cost conscious forms of media available to businesses. Signs advertise to people passing your establishment who normally may not know of your business or products. Signs tell people what you are selling, promote your brand, and are directly focused on the trade of the business. Signs are affordable - if you compare the cost of signs to other advertising media, a well designed, on-site sign is quite inexpensive. Signs are for everyone - the use of signs is practical because reading signs is beneficial. People read to remember and they retain the information on signs for future use. Signs are on the job 24 hours a day, seven days a week - this can be considered non-stop, repeated messaging about your business, brand, and product. Every time a customer passes your business, they see your sign; the simple message repetition will help them learn and think favorably of your business. Marketing Your Business With Signs and Banners! No matter what your business is an economical and long lasting way to market your company is with the use of signs and banners. With so much competition in the marketplace signs should stand out and be welcoming. Signs should give the customer an idea of what's behind the sign and hopefully what kind of experience they should be looking forward to. Signs should also catch the eye and become unforgettable. As a sign is often the first opportunity we have to market a business, we should try to get everything we want to express about our business into the sign. A great sign is probably the best investment in your company's advertising budget! Banners are lightweight and easy to carry or ship to trade shows because they roll or can be flat packed taking up little space. Banners are a fun way to market your company or business. Because of the relative low-cost, banners can be replaced as business changes, you can always have your latest best seller on a banner. A well placed, bright and informational banner can bring a lot of business to your booth at a trade show. Banners can also be used to advertise specials or promotions. Working with a good design team who understand your needs will enable you to create the signs and banners that will help your business grow.